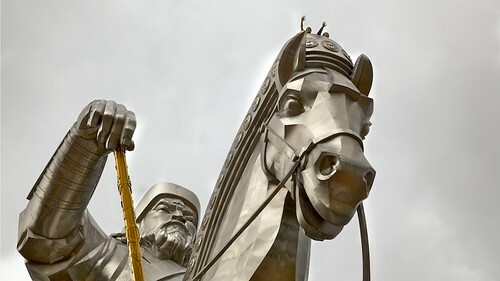 A gigantic statue of Genghis Khan (aka Chinggis Khaan) on a horse back near Ulan Bator, Mongolia, having height of 40 metres (~131 feet) on a 10 metre (~33 feet) high base is the tallest and largest equestrian statue in the World. 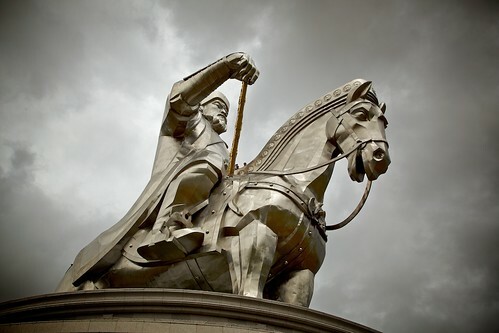 Genghis Khan, who created World's largest contagious contiguous empire and was a legendary horseman, is shown holding golden whip in his hand. 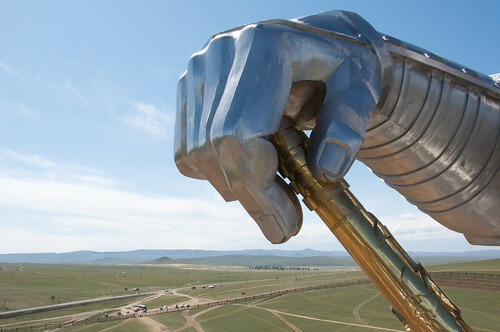 The shinning, stainless steel clad statute is part of a theme park called the Chinggis Khaan Statue Complex built by 'The Genco Tour Bureau', a Mongolian company. Work on the 250 ton statue was started in 2006 and completed same year. The whole area is being developed as a tourist resort/recreation area around a mound called Tsonjin Boldog, near the banks of river Tuul about 54 km from the Capital town of Ulan Bator. 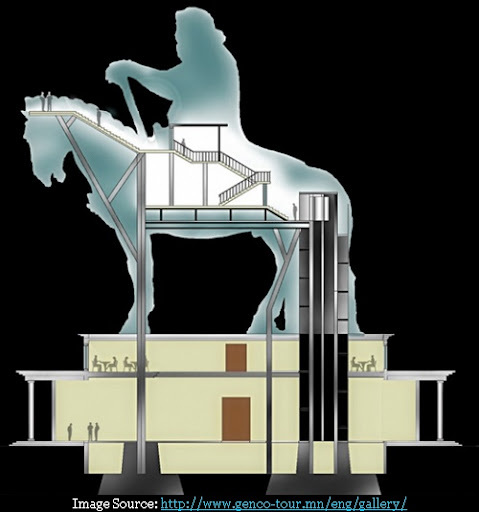 Recreation area, conference room, restaurants and souvenir shops are located in the 36-column base of the Statue and from here visitors ascend to the exhibition hall using elevator at the back of the horse. The visitors can walk to the head of the horse through chest and back neck of the horse, from a deck there they can have panoramic view of not only the entire complex but also of the green steppes. Besides the statue complex, the area will ultimately have 200 yurt tourist camps, designed and arranged like the pattern of the horse branding seal that were used by the 13th century Mongol tribes and the whole area is being landscaped into a green forest. The giant scale of the statue can be gauged by size of two persons waving from the horse's head. Great pun, he did create a "contagious" empire. Great pun, he did create a contagious empire. Thanks hhgygy. The credit for the pun is to Auto correction features. I have put in the right word now. Thanks once again. No need to be sorry hhgygy. I am thankful that you pointed out the error and will request that in case you come across any such bloomers in my blog posts then please do let me know. Thanking you in advance.